Lewis (or Louis) Corbet was in Demerara from at least 1804, finally returning to Inverness in 1813 and marrying Miss Isobel McLeod in August of the following year [GROS 098/00 0080 0300]. Isobel's sister, Jane, had married Roderick Macleod, also a merchant in Demerara, in 1811. 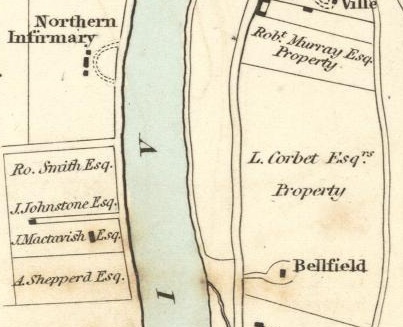 When he died in 1836 he was styled Lewis Corbett Esq of Bellfield [SC29/44/5] and owned a substantial house, with grounds, on the south side of the town. In Demerara he was in partnership in Cumingsburg with a ‘N M’Kinnon’ - probably Neil Mackinnon - with whom he owned a number of slaves, and possibly ran a ‘task gang’. In May 1813 they placed an advertisement in the Essequibo & Demerara Royal Gazette forbidding anyone to hire their slaves on a Sunday, the slaves’ free day. This was because the slaves were being paid in rum for this unauthorised Sunday work, became drunk and were unable to ‘do their regular duty’. Corbet travelled back to Scotland a number of times in the years between 1804 and 1813, on one occasion taking the son of John Noble back to Inverness where he was to be educated. Donald Mackay, also of Inverness, described Corbet as 'my particular friend' [NAS GD23/6/527].